Every summer intern begins their role with a formal training program. The PIMCO Fundamentals training program will provide you with the skills, knowledge and relationships that will prepare you for a successful internship. 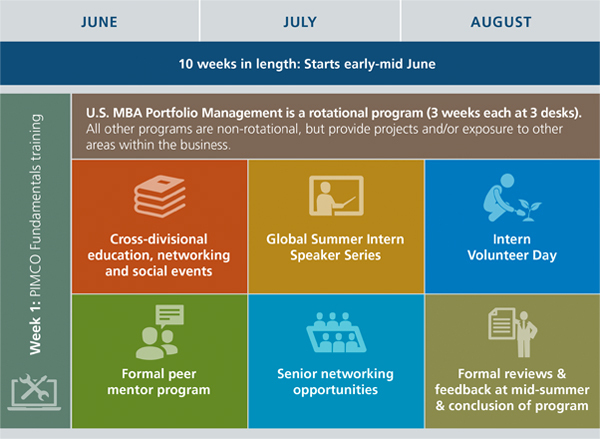 Your informal training will continue throughout your summer at PIMCO – every day in a perpetual learning environment. In addition, you will be teamed with a peer-level professional who will offer guidance and mentorship. Minimum 3.2 cumulative collegiate GPA, on a 4.0 scale (EMEA minimum 2:1) or equivalent, at an accredited college or university.